For years, Georgia students have learned about the official state bird (Brown Thrasher), the state flower (Cherokee Rose), the state tree (Live Oak), and the state song (Georgia On My Mind). The newest generation of Georgia students will also have the opportunity to learn about our new official state school, Plains High School in Plains, Georgia. Plains High School was built in 1921 and closed as a public school in 1979. Both President and Mrs. Carter attended all their public schooling in this building. After a six-year restoration project, the building has been converted into a museum for the Jimmy Carter National Historic Site. Restored classroom at the Jimmy Carter National Historic site. The Museum has a video featuring President and Mrs. Carter as well as other residents of Plains. 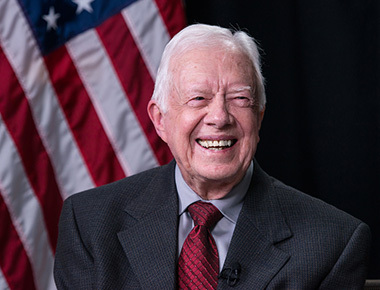 The video gives you an overview of Plains, the campaign days and the Carter Presidency. A 1930s restored classroom gives the visitor an opportunity to step back in time and see how classrooms looked when the Carters attend this school.